A Romanesque cloister – the only one of its kind in France. A medicinal plant garden with 250 species from Britanny and the rest of the world. A monumental 16th century fountain. 17th century cavalry statues – 180 of them, restored by American officer John D. Skilton after WWII. The abbey regularly holds excellent archaeological, historical or ethnological exhibitions. Around the village, you’ll find the strawberry fields that Brittany is famous for. Abbey and gardens are both fully disabled accessible. Check out the gift shop. Leashed dogs are allowed into the garden but not the abbey. Timings given are for 2015, and may change later on. Take bus/taxi/car to Daoulas from Brest or Landerneau. Road N165 between Brest and Quimper. How popular is Daoulas Abbey? 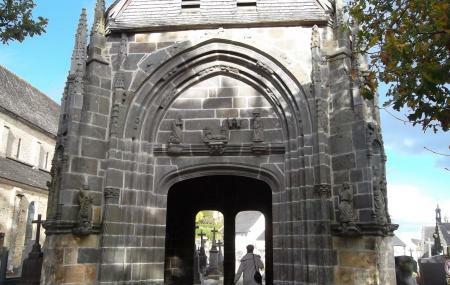 People normally club together Helen And Edouard Leclerc Fund For Culture and Landevennec Abbey Museum while planning their visit to Daoulas Abbey. So beautiful and so interesting in The most quaint french town. There is a cafe, gift shop and museum/gallery which was all really nice but the gallery exhibition was only in French which in our experience seems to be normal in this part of Brittany hence the 4stars. Still I couldn't recommend a visit hear enough especially to a gardener it's a dream day especially in early summer. Nice garden and exhibition about hair. Quite new. At €7 per person entry, it was above our groups pay grade. Visita agradable de la antigua Abadía y los jardines. Exposiciones temporales. Fácil paseo.